Having established himself as an action star in his 50s, Irish actor Liam Neeson takes on yet another everyday hero in the Universal Pictures crime drama, A Walk Among the Tombstones. Neeson plays an ex-New York cop turned private eye, who is hired by a drug kingpin to find the kidnapper who brutally murdered his wife. As Matt Scudder, he delves into the case, and discovers that he is not dealing with ordinary criminals, but twisted vigilantes who know their targets won’t turn to the law for help. The film also stars Dan Stevens, best known for his role as the doomed heir on the TV series Downton Abbey. The British actor easily slips into the drug kingpin role with an American accent. A widower since the unfortunate 2009 skiing accident of his actress wife Natasha Richardson, Neeson recently spoke about his midlife rebirth as an action hero, what he liked about playing the flawed Block character and what’s ahead. Below is a very revealing interview with Liam Neeson that says its all. Q: Scott mentioned that some characters like yours have to find the worst in themselves, before they can find the best. Could you comment on that as part of your human role? Neeson: Did Scott say that? He probably would. He's a writer. Yes, he had mentioned that to me when we'd met. I wanted to find some kind of research I could do, other than reading Larry's books. I know some policemen, and one of them I know very, very well. I was able to get access to documents on serial killers, and not just the crimes, but also the police work that went into tracking them down, which was very, very fascinating. Any little minutiae of evidence they would find, and put it together with this, and does it connect, and oh my God, it does connect. That was fascinating. I thought Scott had done that on a continual basis, and maybe, unbeknownst to himself, it brings out the good in [the character]. I think Scudder is a good, righteous old-fashioned kind of man. I think he has certain pillars of ethics that never change, even though he's kind of f***** up in a lot of ways. But he's essentially a good man. Q: What was it about this character and the characters you’ve played that draw you into playing them? Is it something specific about playing the character that's real and a tough guy too? Neeson: I’ve always liked these grizzled characters, who have one foot on the side of law and order, and the other foot in the bad guy's camp. They’re always treading a very delicate line. I just find them very appealing. It's great to get a chance to do that. I'm glad you think they're realistic, because that's what we're trying to do. Q: Is there a reason why you choose these characters? Or is it just because you're so good at it? Neeson: Thank you. I appreciate the compliment, I really do. Listen, I was in my 50s, when this Taken movie came out. I was sure it was just a straight-to-video, good little European thriller, well made. And Fox Studios took it and did this amazing sell job. They showed the trailer at big sporting events and the film became a hit. I started to get sent these action scripts, in my 50s! It was very flattering, and I felt like a kid in a toy shop, so why not do them? I didn't pretend like I was a 27-year-old. I try in these fight scenes to fight as a 50-year-old—even though I'm 62. I’m not playing a superhero. Neeson: (joking) It's all my own, too. Q: It establishes why your character is the way he is later in the movie. Can you talk a little bit about doing this scene, because it's kind of an extended scene, and it keeps coming up throughout the film? 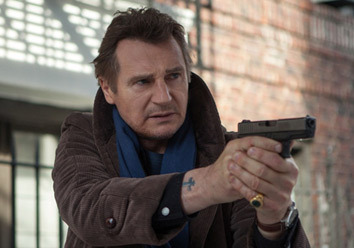 Neeson: We shot it over two or three days. We had access to an area North of Manhattan. We had that whole set of steps, where the bad guy falls down and stuff. It was on a Saturday, and we shot that bar scene during that week. So it was really only two or three days of the wig. I wanted to avoid that classic drunk stuff. That's really hard to do—to act drunk. My character is a functioning drunk. Q: Do you have an exercise routine or special training to be ready for whatever role comes up? Neeson: I keep pretty fit, in life. Before going into a role like this, I step up the regimen a couple of months before. It's important to keep fit, and I'm not talking about having perfect abs or stuff, but you have to be on top of your game, especially if you're playing the lead. You have to look after yourself. Q: You’ve got a packed schedule and you’re raising two sons by yourself. How do you balance all the work you’re doing with spending quality time with your kids? Is it something you have to work at? Neeson: Oh yeah, I've got to. Listen, I have a great support team, I really do. Fantastic family. If I'm away on a project, my mother-in-law (the British actress Vanessa Redgrave) moves in. We're sort of like chess pieces. (He chuckles.) But yes, it's always a balance. I'm very fortunate to get to play these characters at this stage in my life. I love doing it, and I'll keep doing it as long as they keep sending me scripts. My kids are used to it, from the time they were born. One of them was born on location. So they're used to dad being away for certain periods of time. So far, it's worked out okay. Based on Lawrence Block's best-selling series of mystery novels, A Walk Among the Tombstones stars Liam Neeson (Non-Stop, Taken series) as Matt Scudder, Kenny Kristo (Dan Stevens of television’s Downton Abbey as Kenny Kristo, Boyd Holbrook (Very Good Girls) as Peter Kristo, Kenny’s brother and a recovering drug addict, David Harbour (Quantum of Solace) as Ray and Adam David Thompson (Martha Marcy May Marlene) as Albert, two demented serial killers, and Brian "Astro" Bradley (Earth to Echo) as TJ, a homeless young artist who befriends the ex-cop. A Walk Among The Tombstones is produced by Jersey Films’ Danny Devito (Erin Brockovich, Out of Sight), Double Feature Films’ Michael Shamberg (Contagion, Erin Brockovich) and Stacey Sher (Django Unchained, Erin Brockovich), Exclusive Media’s Tobin Armbrust (Begin Again, Rush) and Cross Creek Pictures’ Brian Oliver (Black Swan, The Woman in Black) and is directed by Scott Frank. Distributed by Solar Pictures (not Solar Films), A Walk Among The Tombstones will be shown in Philippine cinemas starting September 19.